You can extract directly from points cloud sections referred to a planimetric axis and to altimetric profile. The archway creation is performed in an automatic way with possibility of defining the amplitude of the extraction zone and the minimum distance between points of the same section. Sections can be viewed directly in planimetric module, thanks to a special window by selecting them directly on the project axis. 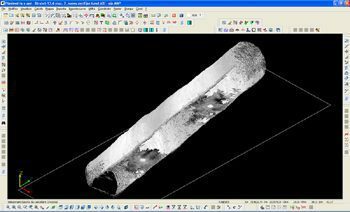 On extracted sections may be inserted project sections for calculating areas and volumes. The underbreak and overbreak zones may be represented planimetrically, with a color scale customizable, with reference to the longitudinal project axis and with reference to the measured distance on the archway compared to project axis.